Opening hours: The shops in Tallinn are usually open from 10h to 19h, banks from 9h to 18h on weekdays (some are also open on Saturday morning) and the post office from 9h to 18h on weekdays and from 9h to 15h on Saturdays. 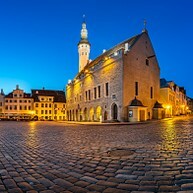 Tallinn is a highly compact city, most of which can easily be explored on foot without the need for taxis or buses. Most of the best opportunities for sightseeing, cultural events, dining, shopping, and nightlife are conveniently massed in city centre. Whatever your agenda, whichever of the Tallinn´s you need – the romantic, Medieval Tallinn or the trendy, high-tech one – the doors are open. Just take your pick and head on in! 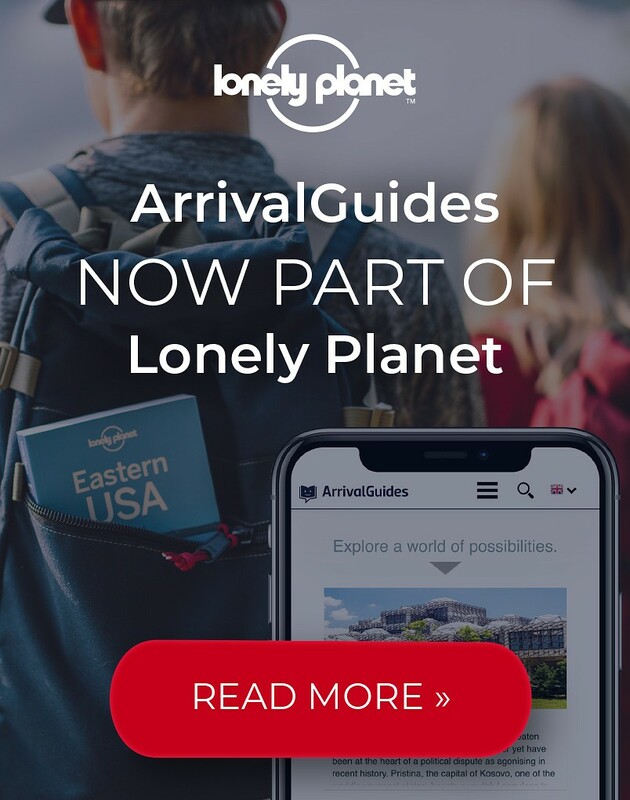 The Tallinn Card gives you free entry to 40 museums and other interesting attractions, one free sightseeing tour of your choice, free use of public transport and a variety of entertainment options. 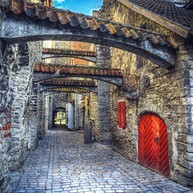 What makes this easily the most picturesque of Old Town's lanes particularly interesting is that it's home to the St. Catherine's Guild, a collection of craft workshops where artists use traditional methods to create and sell glassware, hats, quilts, ceramics, jewelry, hand-painted silk and other wares. This impressive 13th-century church houses a museum dedicated to church art, displaying medieval burial stones, exquisite alarpieces and Tallinn’s most famous painting, 15th-century artist Bernt Notke’s eerie composition, Dance with Death. The building's acoustics also make it a prime concert venue, with organ or choir performances held here most weekends. 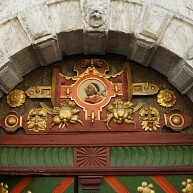 Entrance is free with Tallinn Card. 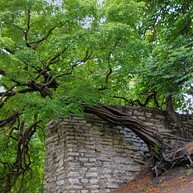 The viewing platform on the north side of Toompea hill sits visibly on the limestone cliff. On the right you'll see the Town Wall with its defensive towers. On the left lies Kalamaja and Pelgulinn areas with Railway Station as landmark. Winding series of steps, built in 1903, lead down the cliff face to Nunne Street and Shnelli park below. 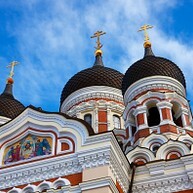 This spectacular, onion-domed structure perched atop Toompea Hill is Estonia's main Russian Orthodox cathedral. Built in 1900, when Estonia was part of the tsarist Russian empire, the cathedral was originally intended as a symbol of the empire's dominance. 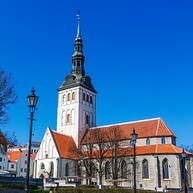 The church's towers' hold Tallinn's most powerful bell ensemble, consisting of 11 bells, including the largest in Tallinn. Once upon a time, from 1549 to 1625 to be precise, this 14th century Gothic church was considered to be the tallest building in the World. But it’s gigantic, 159-meter spire, meant as a signpost for approaching ships, also turned out to be a very effective lightning rod. Throughout the church's history lightning hit the spire repeatedly, completely burning down the structure three times. With 1.9km of its original city wall still standing, Tallinn boasts one of Europe’s best preserved medieval fortifications together with 20 defensive towers. 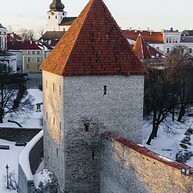 In fact, a large part of what gives Old Town its fairy tale charm is the system of walls and towers that surrounds it. Open since as far back as 1422, this curious little shop on the corner of Town Hall Square is in fact the oldest continuously running pharmacy in Europe. Marzipan was one of the pharmacy's best sellers, one that local legend insists was actually invented as a curative here in the 15th century. This open, garden-like area on the slopes of Toompea Hill happens to be the legendary birthplace of the Danish flag, according to a well-known legend. According to the story, Valdemar's forces were losing their battle with the Estonians when suddenly the skies opened and a red flag with a white cross floated down from the heavens. Taking this as a holy sign, the Danes were spurred on to victory. Today the garden remains a place where locals honor the role Denmark played in Estonia's history. Halfway down the steps towards Rüütli street you can see an iron sword and shield with a Danish cross, and each summer, Danneborg Day is celebrated here. This museum dedicated to all sea-faring aspects of Estonia’s history is housed in one of Tallinn's fattest cannon towers. Fat Margaret Tower (Paks Margareeta) and the attached Great Coastal Gate (Suur Rannavärav), two of Tallinn's most impressive defensive structures, stand guard at the north end of Pikk street. They were built not only to defend the city from the seaward side of town, but also to impress any visitors arriving via the harbor. These days Fat Margaret’s cannon tower is home to the Estonian Maritime Museum, which provides a detailed look at the nation's seafaring past by displaying such things as Neolithic fishing gear, antique diving equipment, and even the entire wheelhouse from a 1950s-era trawler. The extensive museum covers four floors of the historic tower. The Estonian Museum of Natural History tells stories about the nature of Estonia and helps you to make sense of its secrets. 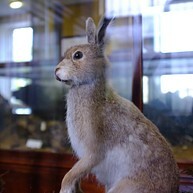 The museum offers a fascinating look at the creatures and habitats of Estonia, as well as wildlife from around the world. There are several seasonal, temporary themed exhibitions every year from alive spiders, edible and poisonous mushrooms to minerals. This beautiful, Renaissance-style guild hall is truly a star among Old Town's architectural treasures. This was the historic home of the Brotherhood of Black Heads, a medieval guild made up of young, single merchants and foreigners. See nearly 200 intricate, marzipan figurines and watch Tallinn's favourite sweet being made in this historic shop-museum-café. In the Kalev Marzipan Museum Room, you'll learn all about Tallinn’s love affair with marzipan. Here you'll find dozens of amazing marzipan creations as well as a marzipan forms belonging to Georg Stude, who founded the shop over a century ago. Children and adults can watch how marzipan figures are hand painted or try their own hand in this craft at a workshop. Explore this sturdy, 14th-century tower, sip coffee in its swank café or walk along the Town Wall for some amazing views. 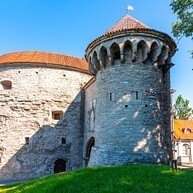 Maiden's Tower, one of the most famous of Tallinn's medieval defence towers, was recently renovated and reopened a museum, complete with an exhibition hall in its vaulted cellar. Its famous café, a big hit in the 1980s, has also been restored to its past glory. Meghede torne, as it was originally called, was built in 1370-1373 along with the wall that runs through the Danish King’s Garden. Visitors get a behind-the-scenes look at the city's famous puppet theater, operating since 1952, at this fun, high-tech museum. 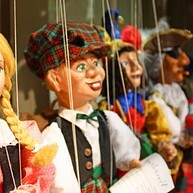 The museum outlines the theater's history and displays dozens of the puppets that have starred in its popular plays. Exhibits include puppets from around the world and a 'Chamber of Horrors' where the 'scarier' puppets are safely corralled. Housed in a 14th century merchant house, this comprehensive museum provides an excellent introduction to Tallinn’s history. It covers all the vital aspects of the city’s past and its development. Various sectors of medieval society are explained using a combination of texts, artifacts, life-sized models and sound effects. High-quality displays on the upper floors are devoted to 20th-century life, its turbulent wars, Soviet occupation, and finally Estonia’s re-independence. Nothing says power like the impressive Gothic Town Hall that dominates medieval Tallinn's main square. It was built in 1402-1404 as a meeting place for the ruling burgomeisters and has been a showpiece of the city ever since. Nowadays the Town Hall – the only intact Gothic town hall in Northern Europe – is used mainly for concerts or for entertaining visiting kings or presidents. From June to August, visitors can climb up the 64-meter tower to get some amazing Old Town views, or head down to the cellars for the occasional exhibition.